China Losing Touch with Chairman Mao? WASHINGTON — Protesters, who have camped out in the capital city of Kiev for weeks, called for the resignation of the country’s interior minister after an opposition journalist was brutally beaten in a midnight attack recently. 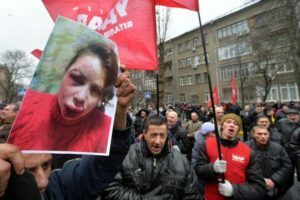 Reuters reported that the reporter, Tetyana Chornovil, was beaten up for reporting the political elites’ extravagant lifestyles as well as the current protests against the Yanukovich government. Pictures of her badly bruised face were held by protesters as they marched onto the Interior Ministry building. This event ignited the passion of the protesters, which had stagnated after the initial outrage over Ukraine’s foreign and economic policies under Yanukovich. Viktor Yanukovich withdrew Ukraine from an economic trade pact that would align it closer to the European Union, responding to threats by Russia regarding its gas imports from their former Soviet ruler.